"What the heck is going on with Mommy? She's tired all the time, eating non-stop and, to be honest, she's getting a little bit fat! "These are the thoughts of the lovable, no-holds-barred protagonist of When I Got a Sister.This first-person narrative is sometimes sweet, sometimes funny and - in the end - portrays all the joy and difficulties that come along with welcoming a new brother or sister.Kids will enjoy realizing, along with the book's main character, what's really going on with Mommy. 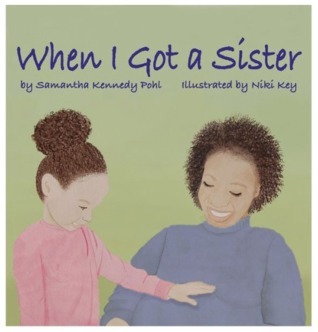 Watch as they read and discover all of the scary but delightful ways the little multicultural family in the book is about to change.Author Samantha Kennedy Pohl wrote this story for her own eldest daughter when she was pregnant with her second child and it comes across as authentic and honest. Artist Nicole Key has crafted warm watercolors that depict a loving little family.This is a great buy for any family about to welcome a new sibling. It also features a multicultural family with biracial children, which can open to door to discussions about diversity or simply act as a display of a modern family with no comment necessary.This would be a great title to see in libraries, where expectant parents can check it out for their little ones, and OB/GYN offices, where there will be lots of young kids expecting a sibling.